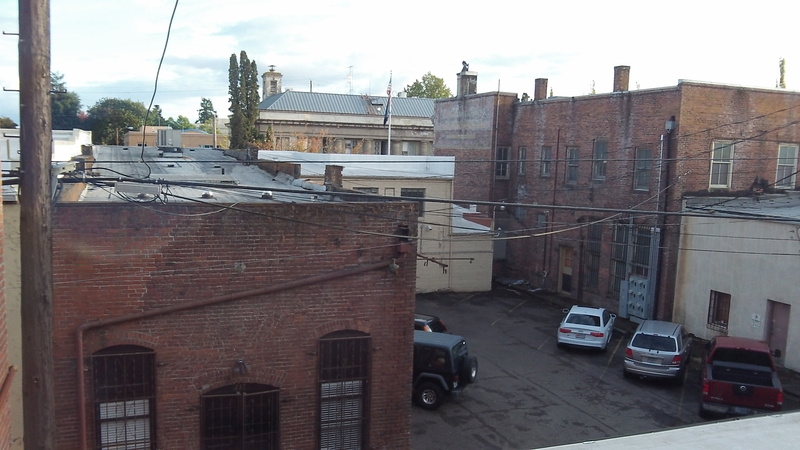 What you can see from a downtown rear window. Looking out an upstairs window of the Flinn Block in downtown Albany last month, I was wondering how well those brick buildings out there would withstand a great big earthquake. Not that well, I suspect. And now we’ve had yet another reminder, in the form of an excellent program on Oregon Public Broadcasting, of how ill prepared our state really is if the Big One hits us in the next few years. The OPB program, “Unprepared,” has been shown three times and will air again at 9 p.m. Oct. 18. It follows up on a report presented to the legislature in 2013. That report was titled “Oregon Resilience Plan,” and it showed that so far resilience is mostly lacking in all the systems — water, transportation, energy, health care and so forth — on which urban life depends. The last great quake along the Cascadia Subduction Zone happened on the evening of Jan. 26, 1700. Over thousands of years such massive quakes, of 9.0 magnitude or so, have happened on average every 250-300 years. Since the last one was 315 years ago, the chances of another one pretty soon are good. When it happens, the coast will be hit hardest, and the resulting tsunami will likely wipe out low-lying towns. The Willamette Valley will not, however, be spared. In Albany and other parts of the valley, we might have to go without electricity for one to three months. Water treatment plants and highway bridges might be out for up to a year. Motor fuel won’t be available because the Portland tank farm supplying all of Oregon sits on a site likely to turn to mush. Hundred-year-old brick buildings downtown, in other words, won’t be our worst problem. The Resilience Plan lays out things to be done over the next 50 years, by the private sector and the state government. You’d think local authorities would be interested too. But you don’t hear much from county commissioners or city councils about preparing to help their residents survive without customary local services for months at a time. Local authorities are interested, I think. The city manager is so concerned about the really big one he re-packed his 72-hour emergency kit and told us to do the same. That the downtown building are unsafe in a quake has been known for a long time. While not directly related to quake preparedness, here is a small bit of information. I contacted my State Farm agent many years ago to see if I could purchase earthquake insurance for my home. The answer was no — we live in one of the historical homes. It’s in fine shape, but it is not up to today’s earthquake standards. I don’t know what it would take to get it up to shape. I don’t know that it would be possible to upgrade an old lath-and-plaster home, at an affordable cost, and still maintain its historical look and charm. It seems to that earthquake preparedness is about saving life, both during the quake, the floods or fires that may occur, and in the days and weeks that follow. It seems to make sense to upgrade buildings where many folks reside (schools, hospitals, nursing homes), while rebuilding the others afterwards. If a large quake hits us, we really would need to rely on assistance from the federal government to help out both immediately afterwards to provide shelter, food, and water, and to help rebuild infrastructure and buildings afterwards. No one should rely on the gov’t as a plan A to provide needed help. Do everything you can now. Water, non perishable food stores, blankets, lights–some really easy stuff yet critical. Quit correct. But why do you slam CARA about building codes and seismic retrofits? Building codes are set statewide by the State of Oregon. CARA cannot change or override state set requirements. You owe CARA a public apology. Will you give one, or not? Why should Tom (or anyone else) apologize for making the simple, ASTUTE observation that if a major earthquake hits this area (8.0 or above), these unreinforced brick buildings CARA has often chosen to fund will be a pile of rubble? Hopefully when that happens there will be nobody inside or near them. Don’t insult our intelligence by suggesting we are holding CARA accountable for the building codes. We DO question the wisdom of the investment in these old brick buildings in the face of what the scientists (that you revere so highly) say WILL happen, someday. If an 8.5 magnitude quake hits Albany, hindsight would indeed bring into question the wisdom of investing in century old buildings that are literally impossible to bring up to modern seismic standards. Of course, the Woods crowd will say if that happens, we’ll have much bigger worries…..sounding similar to Hillary proclaiming “…….at this point, what does it really matter?” …… ala Benghazi. Apologize????? That’s what we’ll be asking for from you after “the big one” hits. And we don’t owe you any apologies anyway…… since you don’t live anywhere near the CARA district. A building official stated a separate building permit is needed if/when an existing building is modified to enhance its structural integrity to withstand an earthquake. No such permits have been issued to upgrade CARA project properties. CARA does not require an upgrade even though taxpayer money is spent. The building official is concerned to the point that when he enters a renovated property like the Flinn block–his first thought is how will I get out of here if the quake happens because he knows it will come down. Hey Tom, you’re condemning CARA for NOT imposing NEW regulations on property owners above and beyond the requirements of the Uniform Building Code. Just like your crazy right wingers. You condemn government for regulations on folks, unless you can demand regulations on folks when you want to bash the government for not having more regulations.